We don’t have tests here in my class. We have Celebrations of Knowledge. (Pop Quizzes are call Surprise Parties…because, why not?) 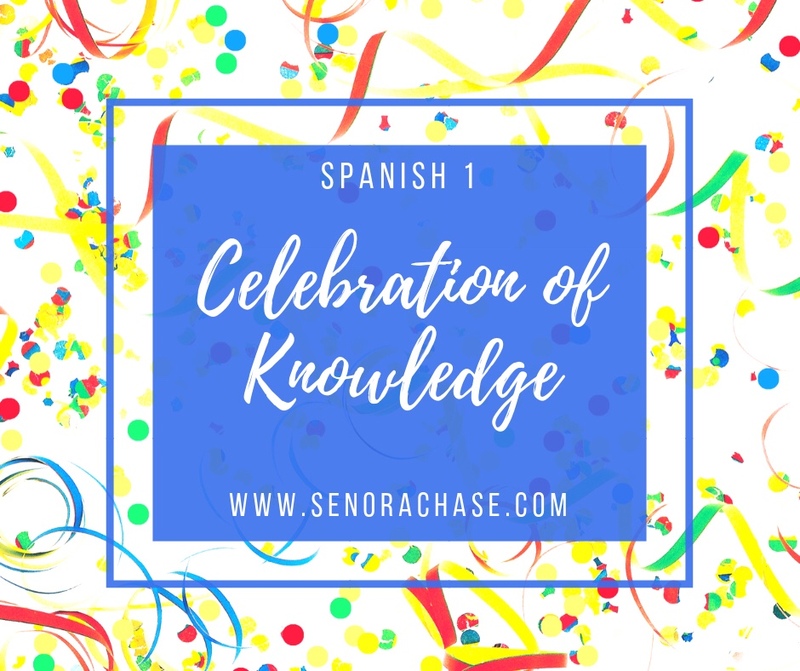 My Spanish 1 little darlings just took their very first Celebration of Knowledge today and I’m really pleased with it…so of course, I thought I’d share it with you! Department wide, we’re focusing on the 4 skills and wanting our assessments to give a good measure of what they can DO in Spanish, using ACTFL’s proficiency levels as a guide. As a department we agreed that students who exceed Nevada’s Proficiency Expectation for any given level should earn an A, students who meet Nevada’s Proficiency Expectation for any given level should earn a B, and students who are approaching Nevada’s Proficiency Expectation should earn a C. Read more about our philosophy shift here. Our district loves Common Assessments. We’ve always written common unit exams and given them to all students in the same level…HOWEVER, this year we’re making a move to Untargeted Vocabulary and so we needed to figure out HOW to write Common Assessments when they students have been exposed to different vocabulary. It’s low stress and low stakes! Anyone who wants to take a similar version again can, if they feel like it wasn’t a good measure of the Spanish they’ve acquired. We want their grade to reflect the language they’ve got! It’s easy to grade…Hallelujah! On average it’s taken me 30-40 SECONDS to grade EACH test. Praise Jesus! Because I’m all about simplifying and I’m really excited about my Reading and Listening Quick Quizzes, we just adjusted them to work with our test, err, Celebration of Knowledge. Without further Ado…Here’s it is! Feel Free to make a copy and personalize it for your classes! NOTE: I wrote the Listening and Reading portions using vocabulary I knew they were familiar with, BUT it’s brand new…they’ve never heard/read these stories before. Each section of this test was worth 25 points. To make the grading fast and easy, I wrote out numbers in bold to correspond with each letter grade. So, next to C, you’ll see numbers 17.5-19.5. That’s telling me that 17.5/25 is a C- and 19.5/25 is a C+. I didn’t want to have to get out my calculator to figure out the percentages while I was grading. And I don’t even write the grade on it…just circle the number. Go, go Speed Grader! I entered this in the grade book as 3 separate grades: They got a Unit 1 Listening Test grade, Unit 1 Reading Test grade and a Unit 1 Writing Test grade… which even saved me more time because I didn’t have to write an overall total at the top of the test. And since my fabulous TA alphabetizes every thing, it makes entering the grades into the grade book a breeze. Work smarter, not harder, people! Just because they wrote somethings next to the A doesn’t necessarily mean they earned an A…I’m still the teacher and I’m going to use my judgement to determine if those were in fact specific details from the reading or just main ideas… Look at the kiddo below, he has lots of specifics in the B section…even though he doesn’t have anything written next to the A, he still earned an A because he showed me that he understood the specifics of the listening. The teacher’s job is to read it and choose the grade that best reflects their listening/reading comprehension skills, students are NOT choosing their own grade! For the Listening and Reading, I read the A section and B section. I don’t look at the C section unless they don’t have anything written in A or B. And Section B has to Support Section A…It is possible for a kid to miss the maid idea…but get some specifics. Look at the kiddo below…she earned a B, even though she has lots of writing next to the A section, because she didn’t show me that she completely understood the listening section. You’re the teacher, use your teacher judgement! That’s it! I’ve been teaching a looong time and this is the first test I’ve written that was EASY to grade and gave me an ACCURATE measure of what they can understand and write in Spanish. If you try it out, I’d love to hear how you adapt it to work with your classes. Previous The life-changing, no stress, no grading, no sweat way to assign speaking, listening and reading grades. Me encanta!! You are brilliant Señora Chase!! I am going to try to use your template for my first Celebration of Knowledge with my Spanish 1 class. I love your blog – you are my CI super hero 🙂 Thank you for all that you share! CI Super Hero?! That made my night! Muchas gracias! Thank you so much for sharing this! I am just back from a conference on CI and am going to work really hard over the next few months to switch my department to using more CI at least in the earlier levels. I am not sure if I can get the AP tracked kids away from a textbook in the upper levels- maybe eventually. But muchas gracias!!!! I love this assessment. Do you have something similar for Spanish 2? I’m only teaching Spanish 1 and Spanish 4 this year, so no…but I would use the same format. On my link to the quick quizzes, I have them for Level 2, so I would adjust the test accordingly and use slightly more complex listening and reading passages. That was my big question too – how do you best adjust for higher levels? I LOVE this idea, and think it makes it so clear to students before they even turn in the page what they are capable of. I’ll write a post about my Spanish 4 test they just took… it looks similar with different material. OMG, where have you been all my life?!?!? I just gave this test to my first year German students (they meet every other day), and it was the easiest-peasiest grading I have ever done. Not to mention that the kids felt a lot less stressed, knowing they couldn’t fail (or even get a D)!!! I’m going to try it next week with my level 3 kids. THANK YOU!!!!! Just one question: do you follow this format for every test (just changing the reading/listening selections and writing prompts) in every level? Hi! I’m so glad you found it useful! You’ll want to adjust the ACTFL levels for different levels. I wrote a post about my level 4 Celebration of knowledge if you want to check it out. Thank you so much for posting this assessment – it was easy to put together, easy to grade (I’m in total agreement with you about grading, I’d rather be lesson planning with my time!) and the students overall felt successful. My one question for you is what do you do when a student doesn’t accurately identify the main idea (makes it too general or writes something like “a story about Pablo” but doesn’t identify the overall idea) but then lists out details in the Novice High section that were somewhat basic too? That happened with a few of my students and I wasn’t sure how to grade that? Thoughts? Did that happen with your assessments? Yay!! I’m glad it worked well for you!! I noticed that with 1 or 2 students as well that caught details but missed the main idea. For me they’ve got to get all 3 sections for the A so I’d either give them a 90% so it’s still an A but write a note in the main idea section that they need to elaborate more… or give them a high B, like 88% with the same note. What do you think? That’s exactly what I did…I gave them either a 22 or 22.5 with a note that they needed to explain more in the main idea section. Going forward, I’ll explain that better in the beginning. Yep!! And I also remind them that I’m their teacher, I’m still going to grade it. Just because they filled up the page doesn’t automatically earn them an A.
Ooooh….adding lines is a great idea!! Thanks! I’m so torn between making the spaces larger or keeping it on one page! I feel like grading one page is so much less painful!! Do you use the same assessment for mid-term and final exams? Yes! My semester final looked suspiciously like this! Of course the reading and listening included structures from the whole semester or year.